The name of this stone phenomenon shows exactly what the rocks resemble. Kamenna Svatba (stone wedding) is situated near the village of Zimzelen, several kilometers away from Kardzhali. 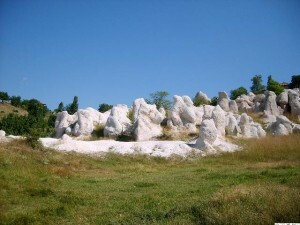 Similar to Skalni Gubi phenomenon near the village of Beli Plast, nature is responsible for shaping the Zimzelen stones. Underwater volcanic activity created the rocks and weather conditions gave them form after the water withdrew. The availability of various minerals in the rock composition gives the figures unusual shades. 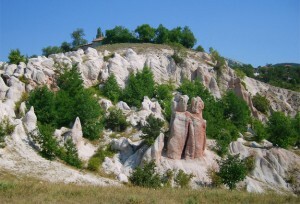 Kamenna Svatba received its name because of a group of rocks that resemble several people. Two legends describe their appearance. According to the first one, God turned the humans into stones since the father-in-law desired the bride. The second legend focuses on a folk ritual according to which no one is to see the face of the bride during the wedding. Yet, strong wind moved the veil and the face of the young woman was exposed. To punish everyone, nature turned the humans into stones.